This was a fairly quick rendering that I have pulled out of my archives. Its dated Fall, 2002. 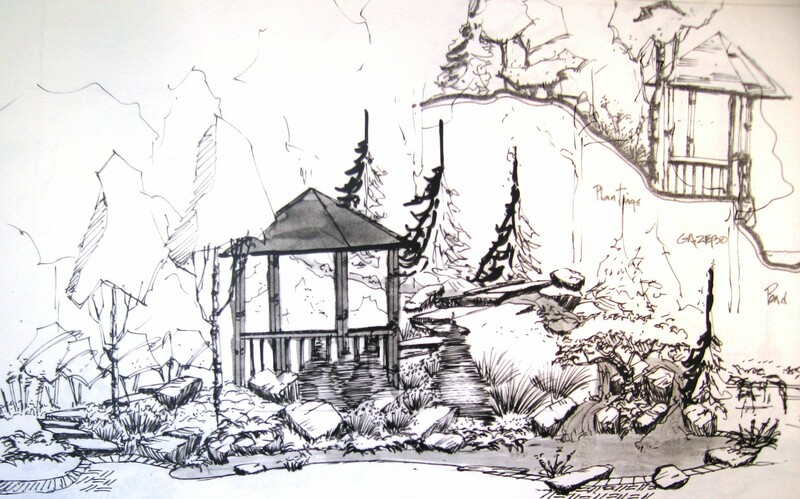 The drawing show the possibility of a gazebo that has a stream and falls wrapped around on a hillside. I always thought the contractor of record did a poor job of selling this job and lost it to another contractor who put in something much less substantial for almost the same amount of money. Sour grapes on my part-maybe so. Then again maybe I could have come up with a better set of drawings to help sell the project. I know that if I were to draw this today it would be at more of an angle to the gazebo, and there would be some color thrown in . Just found your blog – fantastic artwork – can’t understand why your non-client didn’t accept your gazebo design, I would have, even just for the opportunity to scam the original drawing off you ! Well Gary, I still have that drawing . . . . Gary? I love the “loose” style in yoru paintings, I achieved it – once. Was doodling one saturday morning with some ink and watercolour and came up with something that I thought was quite good – put it on a commercial art web site and sold it immediately to someone in Arizona. I’ve been trying ever since but the “magic” won’t come back ! keep doodling, doodle at times and places where you normally do that. Also use different tools. Previous PostPrevious Avon calling??? I think not . . .